The Verve Pipe are recognized worldwide for their radio hits, “Photograph,” “Hero,” “Never Let You Down,” and their massive 1997 #1 single, “The Freshmen,” among others. Even though The Verve Pipe hasn't had a hit in more than 20 years, the band continues to grind it out. It isn't easy staying afloat as a recording artist, particularly when your last big hit reached the charts more than 20 years ago. That's the story for The Verve Pipe. Vocalist-guitarist Brian Vander Ark realizes how close he was to actually working a regular job. "It happens to musicians, even guys who end up on the charts, they have to find a way to make ends meet," Vander Ark said while calling from his East Lansing, Mich. home. "Things change and you have to adapt." The Verve Pipe made a necessary change a decade ago when the band entered the children's market to sustain the group. 2009's "A Family Album" and 2013's "Are We There Yet" feature clever and breezy kids-oriented material. "We realized that there is a market out there for kids' music and we embraced it," Vander Ark said. "We decided to go and make an album with four-part harmonies and guitar solos and the kids love it. We make more money on the kids albums than the rock albums. Kids actually buy CDs. They want to leave the show with something. If it weren't for our kids music, I would be at the mall working at Guitar Center, where a lot of guys, who had hits in the '90s, are presently employed." Vander Ark doesn't have to worry about scoring honest work. The Verve Pipe's gig as children's artists is flourishing so the act can concentrate on rock material and tours. "We can go out and play the hits and the deep cuts," Vander Ark said. "Photograph" and "The Freshmen" are a pair of The Verve Pipe singles from the band's 1996 album, "Villains." The former reached the top 10 of the Billboard Modern Rock charts and the latter reached the top 5 of Billboard's Hot 100 singles chart. "It was surreal to have not one, but two hits on that album," Vander Ark said. "I know how hard it is to have a hit. It's not just about writing a great song, but it's other variables that go into the mix." Those two tunes remain as The Verve Pipe's most successful songs. 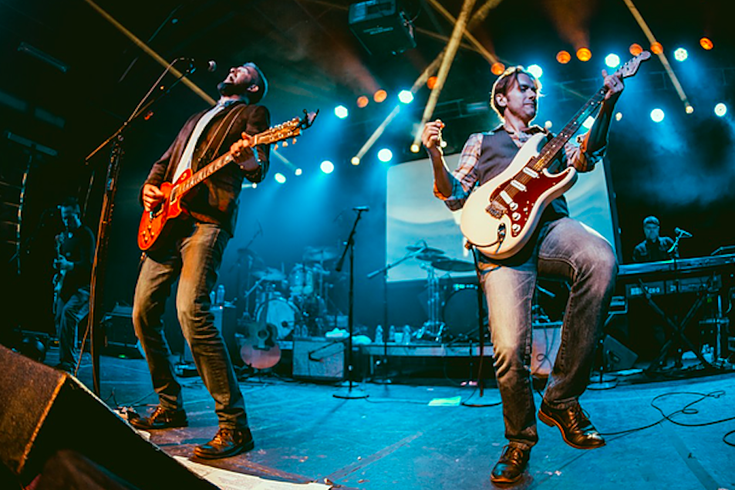 The Verve Pipe, which also includes guitarist Lou Musa, keyboardist Randall Sly, drummer Sam Briggs, bassist Joel Ferguson and multi-instrumentalist Craig Griffith, has no problem playing their hits every night. "I know some bands have issues with that, but we love it," Vander Ark said. "There's nothing like 1,000 people singing along with something you wrote. It still gives me the chills when I see that. I have no problem singing along with an enthusiastic group of fans. There's nothing like it." If it weren't for our kids music, I would be at the mall working at Guitar Center..."
The Verve Pipe, which will perform tonight at the Ardmore Music Hall, is content headlining theaters. The band isn't looking for support slots with big-name bands. "We went through that," Vander Ark said. "We opened for KISS and it was terrible. Their audience doesn't want to see anyone but KISS. We were spat on." Vander Arks laughs when asked about what it was like interacting with KISS bassist Gene Simmons. "He came back and told us that we were KISS opening act virgins before we did our first show," Vander Ark said. "He offered us career advice. He urged us to keep doing what we're doing and we've held on to that advice. We've done what we can to keep this going and we're going to continue to do whatever can to keep The Verve Pipe alive." The Verve Pipe appears Thursday, Jan. 18 at the Ardmore Music Hall, 23 East Lancaster Ave., Ardmore. Tickets are $20 and $29. Show time is 7:30 p.m.